Clip-In hair extensions and halo hair also named FLIP IN are the most popular type of hair extensions. They are easy to install and can be removed even faster. If you’ve been thinking about entering Rapunzel territory, check out our trusty guide. Here are a few things to check before buying clip in or halo hair extensions. Once women understand the different types of hair extensions and their many methods of application, they can then move on to determining how much hair they actually need to purchase. 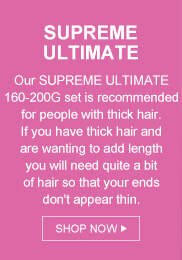 As a general rule, the average head needs about 150g to 200g of hair extensions to complete the process. The hair amount will depend on a number of things, such as the wearer's natural hair features, as well as the type of hair she plans to purchase. It is not enough just knowing how many pieces are in a set; because while a clip in set may have 7-10 pieces, they may be light-weight and not have a lot of hair on them. 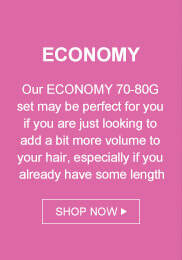 Many sets are only 70 grams which is not enough for a full head if you want to add length. How many grams you need for a full head depends on the length you want and how thick and long your own hair is. Rule of thumb: The longer you want your hair to be and the shorter and thicker your hair is, the more grams you will need. ​2) How many grams do I need for clip-in hair or halo hair? If you are eyeballing those 24″ long extensions and your hair is only shoulder length, remember you will need a lot more grams for a full head than if you choose 20″ long extensions. And more grams means more expensive. If you do want 24″ length, you will need at least 160grams better 200g. For 20″ length you will only need about 150grams. 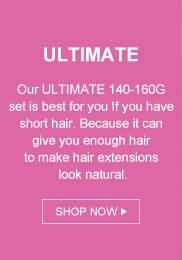 And for 16″ long extensions you may need 140 grams. 3) What length hair extensions should I get? We recommend 20″ long hair extensions because they have the length, but are not overwhelming in weight or length and remain affordable for almost all pocketbooks. If you have short hair, stick with 14-16 inch hair. If you have shoulder length hair, 18-20 inches will work. 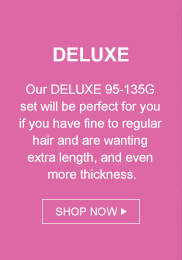 In fact, 18-20 inches is the best and most popular hair extension length. 22-24 inches is really long and will require a lot of getting used to. It also depends on your height, the taller you are, the longer the hair you can pull off. Most choose 20 inch hair, it gives you instant length without the drama and of the 22-24 inch hair. 4)What is remy human hair? Remy Human Hair is the highest grade of real human hair used for hair extensions. The cuticles of Remy Human Hair are kept intact and not stripped. This ensures that the hair remains super soft and tangled free. Non-Remy hair is acid treated so the outer cuticles are removed and silicone treated so that it appears smooth until the first wash. The hair may be cheap, but it will not last. After the first wash, you will have a nest of tangles that can not be combed out. 5)What is the difference between synthetic and human hair extensions?